NEW VIDEO!!!! Looking for something light and delicious for Valentines Day? this is just the thing if you are doing date night in! 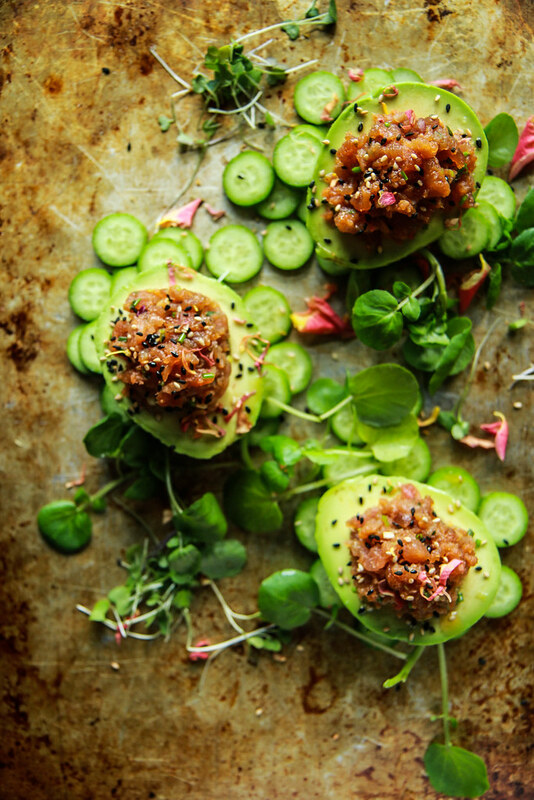 Whether you are looking for a sophisticated and delicious starter for Valentines Day (or any romantic night for two) appetizers for friends or even just a light meal that is Whole30 and Paleo friendly- these Spicy Tuna Poke Stuffed Avocados are perfect. This delicious and very simple recipe was inspired by our trip to Mexico last month. Fresh fish, fresh avocado and that’s about it. This is so delicious and you just need to check in with your fish-monger for some really fresh tuna to make it. (You could also use fresh raw salmon in place of the tuna, I have done that too and it was delicious.) Hope you enjoy! Peel and seed the avocado, squeezing the fresh lime juice over all four halves. Sprinkle them with kosher salt and set aside. Mince the tuna (which I chop that finely with a heavy chefs knife, or even better- a hatchet). Mix the tuna, sriracha, coconut amino acids (or GF soy sauce) and the minced green onion together. 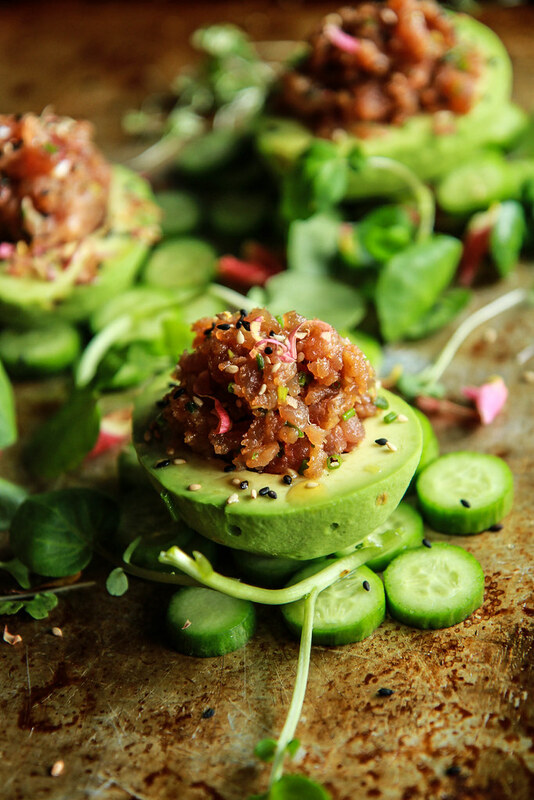 Divide the Tuna Poke between the four avocado halves and then sprinkle the toasted sesame seeds over the top. Serve on a bed of greens and cucumber slices. AWESOME!!!! I am so excited that other people want to do this with me!! I’ve got to try this recipe! I love every thing about this! I was planning on starting Whole 30 next week too and would love to do it with you! Woo Hoo Laura!! I will figure out a good format to do it in. Are you on instagram? Love this take on poke! What an excellent flavor combo! So fresh and colorful and delicious! Those are some of the most perfect looking avocados I’ve seen. Looks incredible! Heather, I love your site. Looking forward to some Whole30 recipes! I love your recipes. You have such a great presentation. I wish you could post more videos! LOL This looks like a delicious recipe and let your daughter know that she did a great job! 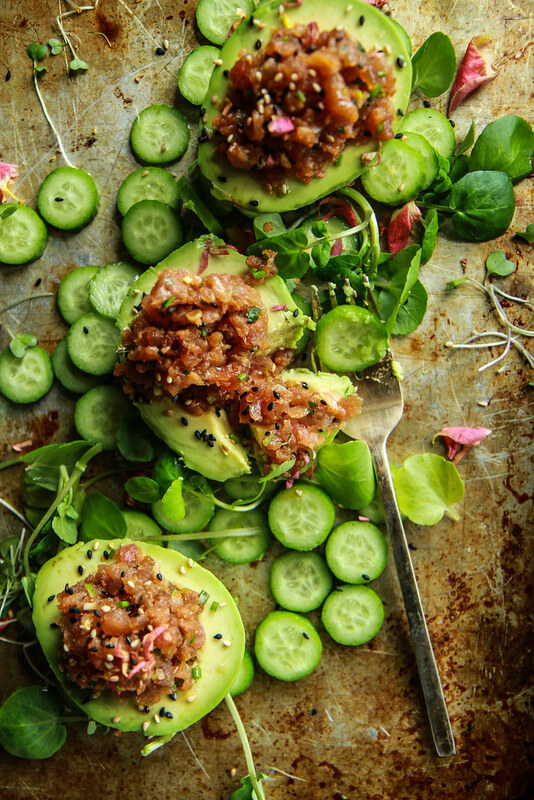 My, oh my…these might just be the best stuffed avocados I’ve laid eyes on! Fabulous idea, so happy to have discovered your site. So different, so clean, so beautifully done. Thank you so very much. I am just retired and am improving my cooking. Your approach is inspiring and right up my alley. Love your site and recipes! Is there anyway you could set it up so when printing a recipe, it doesn’t include the black box (for your video) or pictures that cover the recipe? Oh no!! I can’t get it to recreate that? Do you think it’s your browser? I will send over to IT and see what we can figure out! My wife refuses to eat uncooked tuna ever since she contracted food poisoning from sushi when living in Japan. Can we cook the tuna somewhat? Sure Jim, I would add a little sesame oil to a hot pan and sear it, or you could add more lime juice and let it sit in the fridge and let the acid cook the tuna- it should take about 20 minutes.